Raise your paw if you are a sweet, snuggly little couch potato! I AM! 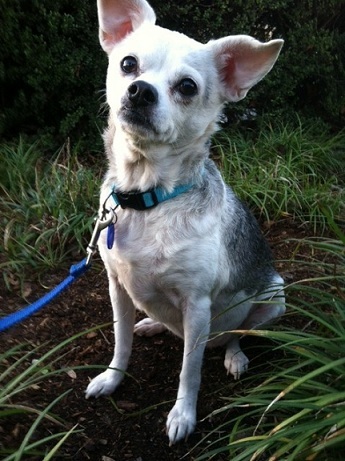 My name is Stella and I am an 8 year old, 16 lbs Chihuahua mix looking for a couch to call my own. Just get me a big bowl of popcorn, turn on my soaps and I am content! You won’t here a peep out of me until it’s time for my leisurely paced walk around the park. I like to explore and smell the bushes (you know that’s the equivalent to doggy facebook, right?) then head back to my warm home, pop in a movie and snuggle with my person until bed time. Doesn’t that just sound like a perfect life? I think other animals are OK, but they can be a little distracting. I mean, I can be watching Days of our Lives and I’m just about to find out who is sleeping with whose husband while his pregnant wife is in the hospital with a coma and BAM the cat jumps up on the remote and changes the channel! That can be so irritating! I’m pretty good at ignoring them though, so I guess I could live with them just fine, but really, I’d prefer not to. What do you think? Want to watch some soaps with me? Then fill out an application at pixieproject.org to schedule a meet and greet! I am fixed, vaccinated and microchipped. My adoption fee is $100 and I’m currently living in foster care.